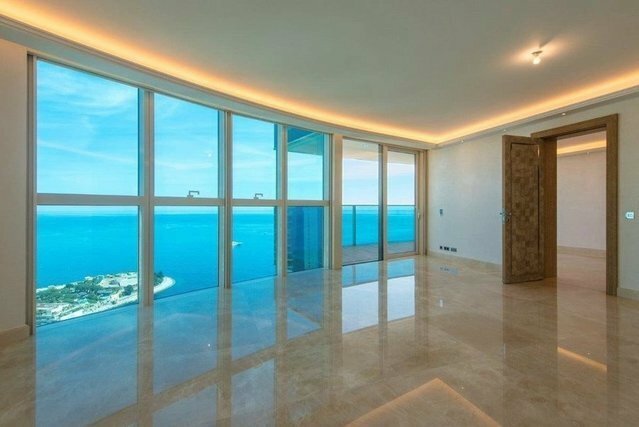 Located in Monaco's most luxurious serviced building, this spectacular building 3 bedroom apartment provides extremely luxurious residential living in Monaco. Located in Monaco's most luxurious serviced building, the Odeon Tower. The residence is opulent beyond belief.Spectacular 3 bedroom property of 215 sq m, providing extremely luxurious residential living in Monaco. The Odeon Tower proposes its residents the ultimate in services with a Sisley SPA and wellness centre, hairdresser and gym, concierge service 24/24hrs and a shuttle service to take you to any destination in Monaco. Floor to ceiling windows and wide terraces allow residents panoramic views over Monaco and the Mediterranean. Possibility of parking space in addition 250.000, 1 cellar located on the 7th basement floor.